Daniel Alfredsson officially retired yesterday after participating in a pregame skate with the Ottawa Senators, then giving his retirement speech. He spent 18 seasons in the NHL. 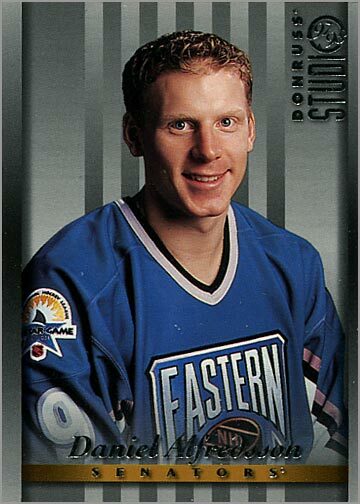 Alfredsson won rookie if the year honors in 1996, played in the All-Star Game six times, and was a point-per-game player for most of his career. Most of these accomplishments were during the “dead puck era,” where NHL scoring steadily declined. 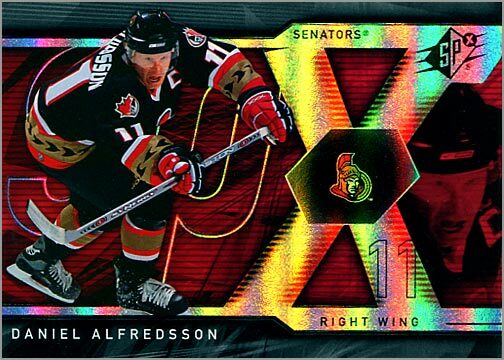 Here’s a look back at Alfredsson’s career — with the help of a few trading cards. 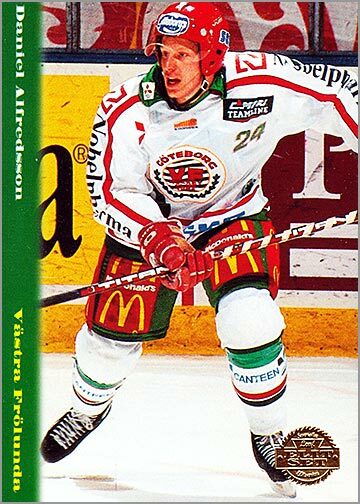 1994-95 Swedish Leaf – Alfredsson spent the first three seasons (1992-93 to 1994-95) of his professional career with Frolunda of the Swedish Elite League. 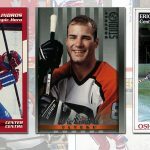 His play during his sophomore season (20-10-30 in 39 games) was enough for the Ottawa Senators to take a chance on him and pick him in the sixth round of the 1994 NHL Entry Draft. 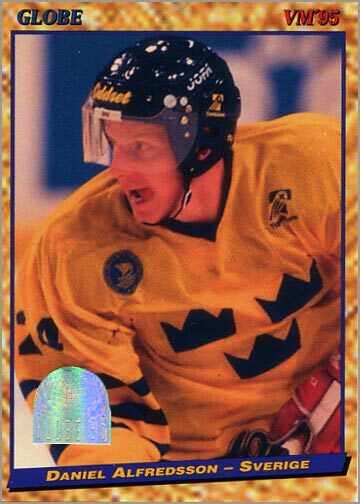 1994-95 Globe – Alfredsson made his debut on the international stage in 1995, winning a silver medal with Sweden in the World Championships. 1995-96 Leaf Limited – In 1995-96, Alfredsson made his NHL debut, chipping in 26 goals and adding 35 assists for the Senators. He won the Calder Memorial Trophy that year as the NHL’s top rookie. 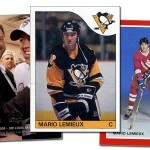 He also played in the 1996 NHL All-Star Game, and for Team Sweden in the World Cup of Hockey, earning a bronze medal. 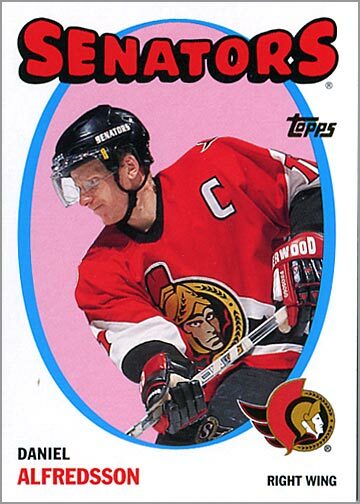 1996-97 Fleer Ultra – Alfie took a step towards captaincy, wearing the A as an alternate captain with the Senators. He played in his second All-Star Game and improved his production to 71 points (24 G, 47 A) in 76 games. 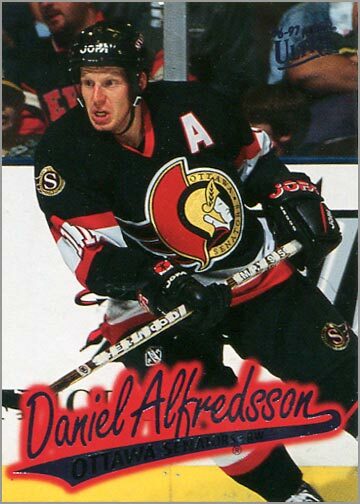 1997-98 Donruss Studio – In only 55 games, Alfredsson scored 45 points. He also played in his third consecutive All-Star Game. 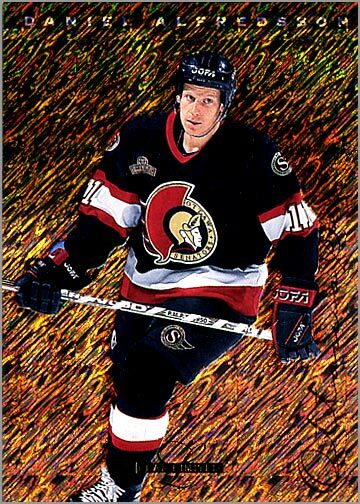 1998-99 Topps Finest – It was a lackluster season for Alfredsson, who scored 33 points in 58 games and another three points in a four playoff games. But the Sens’ first-round loss had a silver — or rather, bronze — lining for Alfredsson, who then played in the 1999 World Championships and won a bronze medal with Team Sweden. 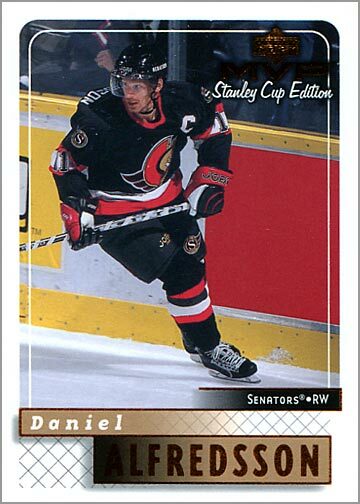 1999-200 Upper Deck MVP Stanley Cup Edition – Alexi Yashin, who was Ottawa’s team captain the previous year, was suspended by the Senators when he demanded a new contract and refused to play. The Sens stripped the captaincy from Yashin and gave it to Alfredsson, making him the seventh captain in team history. The C would adorn his sweater for the next 13 seasons. For the first time in his career, Alfredsson was a point-per-game player (21-38-59 in 57 games). 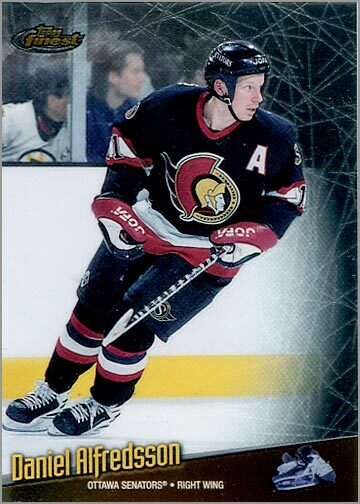 2000-01 Upper Deck Vintage – Alfredsson’s point-per-game pace continued in 2000-01, as he scored 24 goals and 46 assists for 70 points in 68 games. 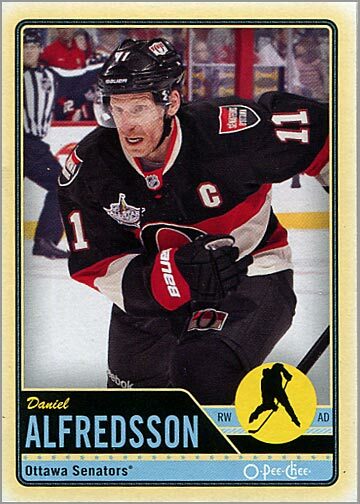 2001-02 Topps Retro Parallel – In his seventh season, Alfredsson would eclipse the 30-goal plateau for the first time, lighting the lamp 37 times. He added 34 assists. 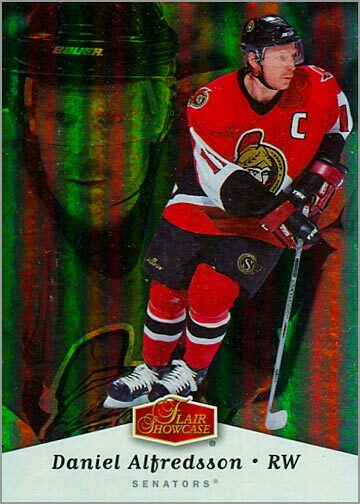 2002-03 Upper Deck Honor Roll – Alfie scored 78 points (27 goals, 51 assists) in 78 games with the Senators. 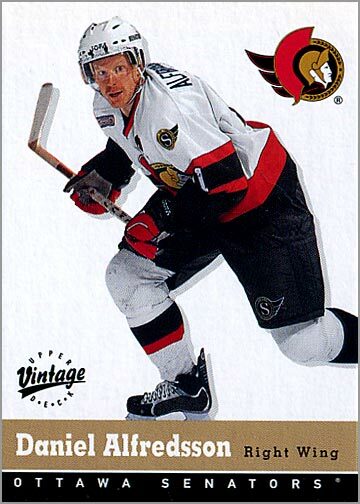 2003-04 In the Game Action – Once again, Alfredsson was a consistent scorer for the Senators, netting 32 goals and adding 48 assists for 80 points in 78 games. That spring, he’d win his second silver medal with Team Sweden in the World Championships. He also played in his fourth NHL All-Star Game. 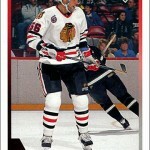 2004-05 Upper Deck All-World – The 2004-05 NHL lockout robbed Alfredsson of a season during the prime of his career. 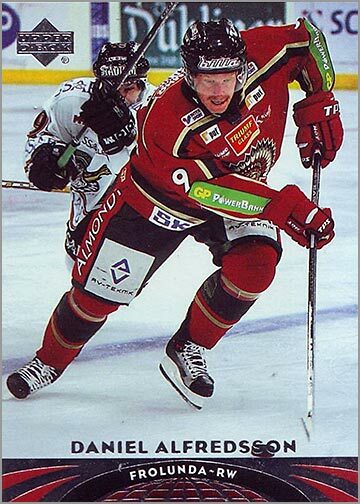 He returned to Sweden and played with Frolunda, the team he started his pro career with. In 15 games, he scored 18 points. In 14 playoff games, he scored another 18 points, helping Frolunda win the Swedish Elite League championship. 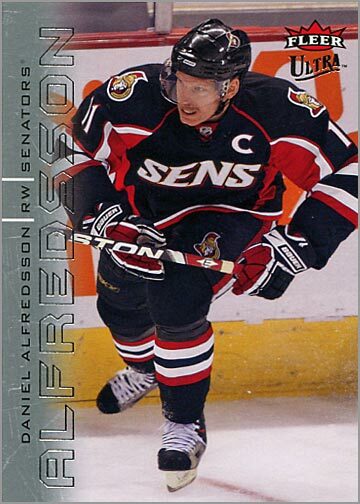 2005-06 Upper Deck – This was Alfredsson’s most productive season. During 2005-06, Alfredsson scored 43 goals and 60 assists in 77 games. He also won a gold medal with Team Sweden in the Winter Olympics, scoring 5 goals and 5 assists in 8 games. 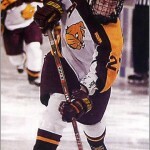 He was named to the NHL Second All-Star Team. Finally, Alfredsson set a record, scoring the first-ever shootout goal in NHL history. 2006-07 Flair Showcase – Alfie scored 87 points (29 G, 58 A) in 77 games. More importantly, he led the team to the 2007 Stanley Cup Finals. 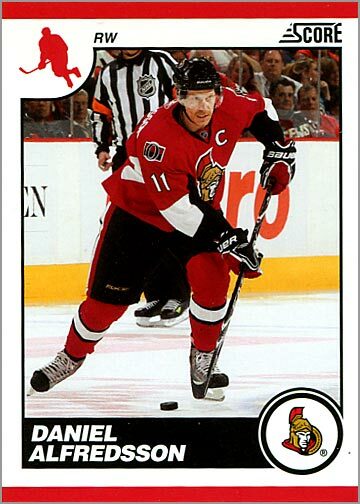 The Senators lost to the Anaheim Ducks, despite Alfredsson leading with 22 points in 20 playoff games. 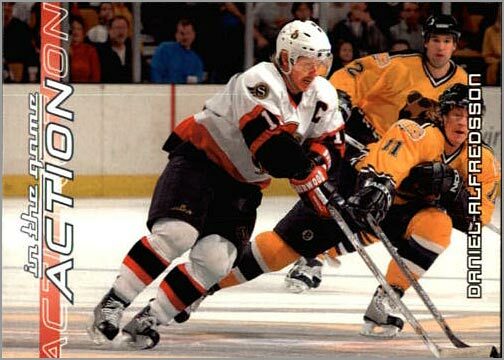 2007-08 SPx – Alfredsson reached the 40-goal mark for the second time in his career when he scored 40 goals and 49 assists in 79 games. He played in his fifth NHL All-Star Game, but this time he was voted as one of the starters. 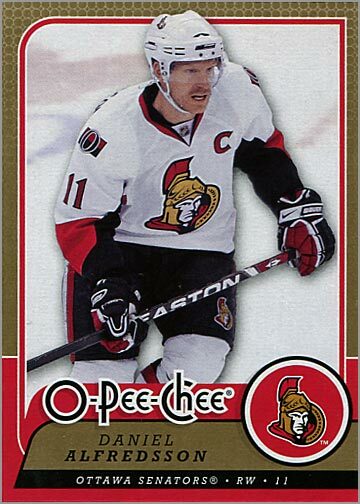 2008-09 O-Pee-Chee – Alfredsson scored 74 points (24 G, 50 A) in 79 games. 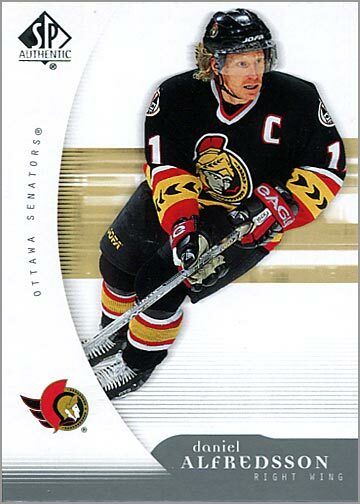 2009-10 Fleer Ultra – This was Alfredsson’s last year as a point-per-game producer, when he scored 20 goals and 51 assists for 71 points in 70 games. He played in his 1,000th NHL game on April 6, 2010. 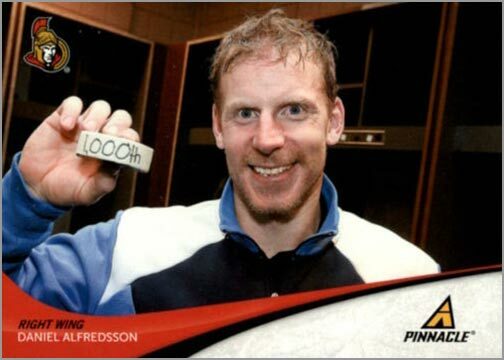 2010-11 Score – Alfredsson scored his 1,000 point on October 22, 2010. 2011-12 Pinnacle – Alfie scored his 400th goal on December 30, 2011. With the NHL All-Star Game in Ottawa that season, Senators fans voted en masse, electing Alfredsson as one of the starters. He was designated as one of two team captains, and then drafted players for “Team Alfredsson.” He also won the King Clancy Memorial Trophy for is leadership and humanitarian cotnributions. 2012-13 O-Pee-Chee – Alfredsson won the Mark Messier Leadership Award. This was his last season with the Senators. 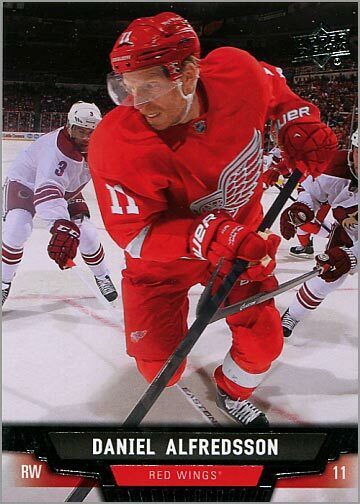 2013-14 Upper Deck – Between seasons, Alfredsson signed as a free agent with the Detroit Red Wings. He put up respectable numbers, scoring 18 goals and 31 assists for 49 points in 68 games. He also played for Team Sweden in the Winter Olympics, winning a silver medal in his final international competition. 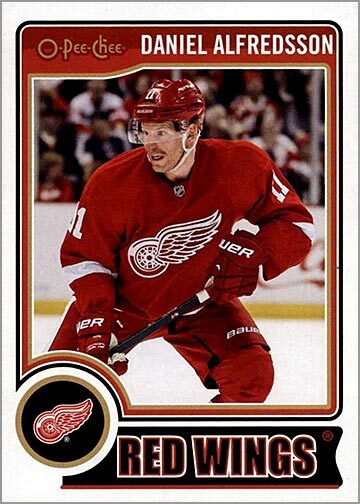 2014-15 O-Pee-Chee – Several trading card sets this year included cards of Alfredsson, anticipating that he would return to the Red Wings for his 19th season. But despite earnest efforts, back ailments forced him to retire. Alfredsson signed a one-day contract with the Ottawa Senators and participated in their pregame skate on December 4, finishing out his admirable career. 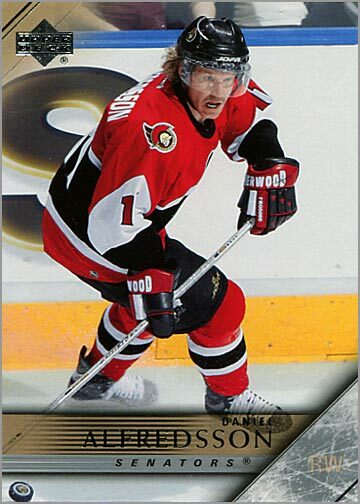 Alfredsson was the best player in Ottawa Senators history, leading the team in games played, goals, assists and points. He accomplished all the milestones that measure the success of an NHL forward: 400 goals, 600 assists, 1,000 points and 1,000 games. He finished out his career with 1,157 points (444 goals and 713 assists) in 1,246 games — roughly 0.928 points per game. 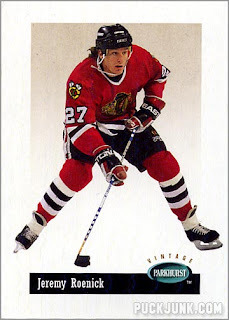 Alfedsson was also a team captain for 13 seasons and was the epitome of class on and off the ice, much like Steve Yzerman and Guy Lafleur.